Store and organize 18 pairs of shoes in about the same amount of floor space needed for one pair. Project holds all shoe sizes from children to adult. 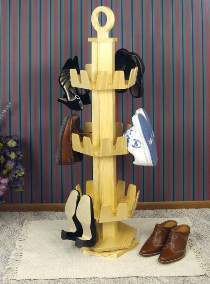 Revolves on a Lazy Susan bearing so you can easily find the pair of shoes you want. Handle allows you to lift and move the entire project. Patterns drawn full size. Measures 48"H x 11-1/2"W. Order one Lazy Susan bearing separately below.